Figure 2. 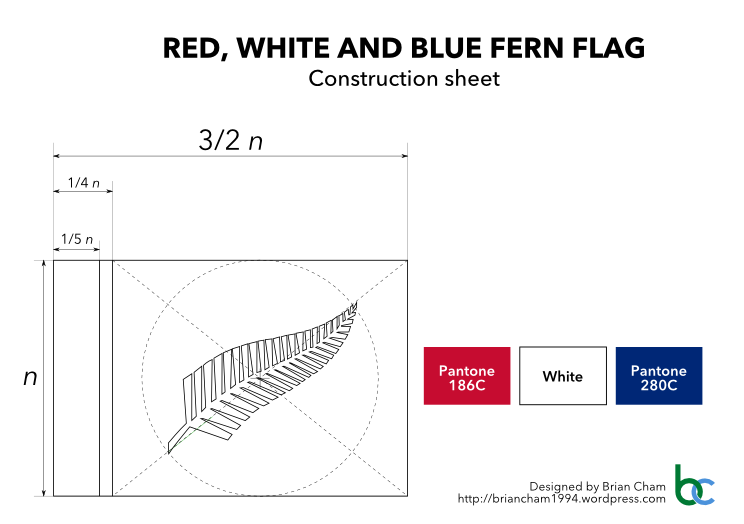 Construction sheet of Red, White and Blue Fern Flag. Full PDF document available on request. When I initially published this flag, I just said “the best symbolism is that which you don’t have to explain”. I still stand by that. Instead I’ll explain what’s unique about this proposal. You may have seen other flag proposals. What do they have in common? They don’t look like flags. They look like modern art pieces, corporate logos or political statements stuck into a rectangle. Sure, some are pretty pictures, but they wouldn’t look good flying as a national flag. Mentally picture them fluttering in the wind alongside other national flags at sporting events, on government buildings, or in front of a crowd. This flag doesn’t shoehorn a trendy design into a rectangle. It starts with the basic element of stripes, and adds a known emblem. No intricate patterns or pointless cleverness. Just a flag that actually looks like a flag. This principle is the only way to make an acceptable compromise. It’s what so, so many proposals got wrong. Their designers made the rookie graphic design mistake of designing for themselves rather than designing for the audience and the various preferences they profess. It’s what happens when you try to apply a purely art approach to graphic design, thinking they’re the same field. Instead of expressing what I personally feel about New Zealand, I reflected what New Zealanders feel about New Zealand. Instead of inventing new imagery, I drew on pre-existing symbolism to establish continuity and aid recognition. Instead of pushing a message, I made it neutral. Three colours. One focus. Real symbolism. Nothing more, nothing less. According to FlagID, the most similar flags are those of France and Canada – all easily distinguished even at a distance, at a small size or in black and white. Now close your eyes and remember what this flag looks like. I bet you could do it. The simplicity of this flag means that it can work in other contexts. Don’t just take my word for it, check out the previews below. Figure 3. 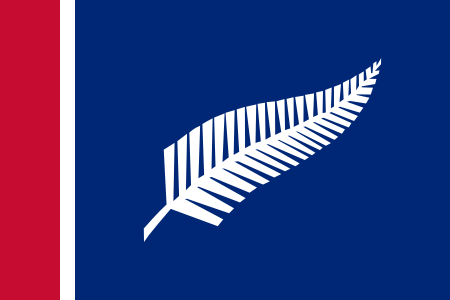 Supplementary material previews for Red, White and Blue Fern Flag. 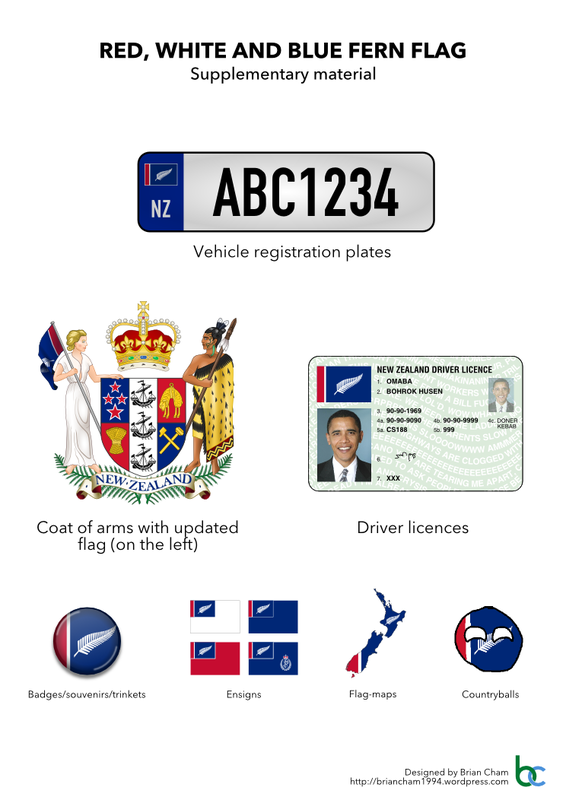 New Zealand coat of arms, emblem of the New Zealand Police Force and portrait of Barack Obama are in the public domain.